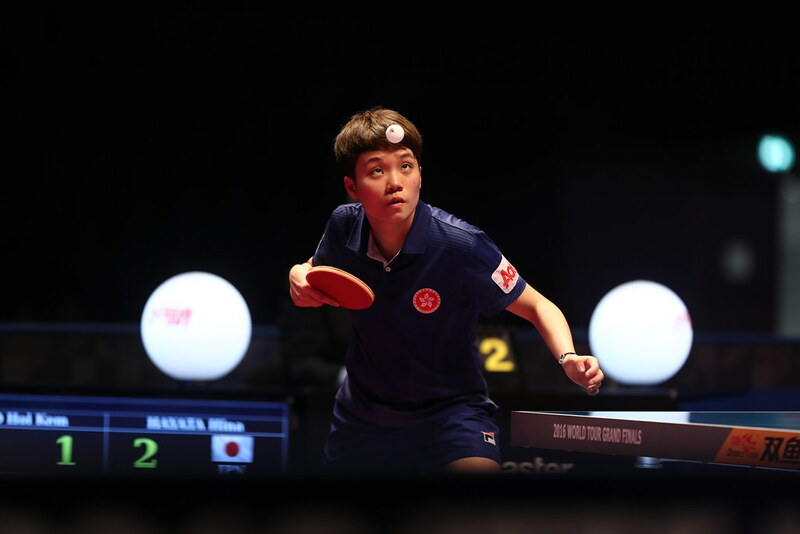 Japan’s Yuma Tsuboi and Saki Shibata emerged as the players to secure the first titles on offer at the 2017 ITTF Challenge Thailand Open in Bangkok on Saturday 1st April. Yuma Tsuboi, the top seed, beat Chinese Taipei’s Sun Chia-Hung, the no.2 seed (11-4, 7-11, 11-9, 11-7) to secure the top prize in the Under 21 Men’s Singles event; the success coming after Saki Shibata had beaten colleague, Minami Ando (11-6, 7-11, 9-11, 11-2, 11-8) to reserve the top prize in the Under 21 Women’s Singles event. Like Sun Chia-Hung, Saki Shibata started proceedings as the second seed; Minami Ando was the no.4 seed. Success for Japan but the focus of attention was on Korea; both Kang Dongsoo and Park Jeongwoo defied the pecking order to reserve Men’s Singles semi-final places. Required to compete in the two day qualification tournament, Kang Dongsoo booked his penultimate round place courtesy of success against India’s Amalraj Anthony, the no.6 seed (11-7, 8-11, 7-11, 11-3, 11-4, 11-9); soon after Park Jeongwoo, the no.13 seed, ended the hopes of Japan’s Kenji Matsudaira, the no.2 seed (11-6, 9-11, 11-5, 4-11, 13-11, 12-10). In the penultimate round, Kang Dongsoo faces Singapore’s Gao Ning, the top seed; Park Jeongwoo opposes yet another Japanese opponent. He confronts Jin Ueda. At the quarter-final stage, Gao Ning beat Chinese Taipei’s 15 year old Lin Yun-Ju, a qualifier (12-14, 12-10, 6-11, 11-9, 12-10, 7-11, 11-3); Jin Ueda ended Indian hopes by beating Sathiyan Gnanasekaran, the no.5 seed (11-4, 8-11, 12-10, 12-10, 8-11, 11-4). Surprise Men’s Singles semi-finalists; not so in the Women’s Singles even where the top four names all reserved last four places. In the top half of the draw, in round of the last eight, Hong Kong’s Doo Hoi Kem, the top seed, accounted for Korea’s Kim Seoyeon in four straight games (11-4, 11-7, 11-4, 11-4). At the same time, Honoka Hashimoto, the no.4 seed, beat Japanese colleague, Maki Shiomi, the no.7 seed (11-5, 7-11, 11-7, 11-8, 11-9). Less than one hour later in the lower half, another all Japanese contest saw success for Hitomi Sato; the no.2 seed, she overcame Saki Shibata, the no.8 seed (11-8, 11-9, 8-11, 11-6, 12-10). Impressive performances and Singapore’s Zeng Jian was not to be left out. The no.3 seed, she ended the adventures of Indian qualifier Ayhika Mukherjee (11-5, 11-7, 11-6, 11-2). Success for Hitomi Sato and Honoka Hashimoto apart; there was also success together. The top seeds, they recorded a semi-final Women’s Doubles win against Chinese Taipei’s Huang Yu-Wen and Lin Po-Hsuan, the no.6 seeds (9-11, 11-3, 11-5, 11-9) and now meet Doo Hoi Kem and Mak Tze Wing in the title decider. Pertinently, the Hong Kong pair ended the last remaining hopes of the host nation. In the penultimate round, they beat Orawan Paranag and Suthasini Sawettabut in three straight games (11-5, 11-9, 11-8). Meanwhile, in the Men’s Doubles event, Japan’s Kenji Matsudaira and Jin Ueda, the no.5 seeds, confront Singaporean qualifiers, Gao Ning and Pang Xue Jie in the final. Kenji Matsudaira and Jin Ueda booked their place in the gold medal contest courtesy of success in opposition to India’s Amalraj Anthony and Sathiyan Gnanasekaran, the top seeds (11-7, 12-14, 11-6, 12-10). Likewise, Gao Ning and Pang Xue Jie caused a semi-final upset; they beat Chinese Taipei’s Sun Chia-Hung and Wang Tai-Wei, the no.3 seeds (11-4, 11-9, 11-9). Play concludes in Bangkok on Sunday 2nd April.